Could caucuses help rebuild bipartisanship on Capitol Hill? With the election sweep, there’s plenty of talk among Republicans about now being able to get things done. But there is also rising concern among observers of Congress that lawmakers are interacting less and less across the aisle. That has been a growing problem for many years, with members literally not knowing each other and distrust becoming deeper. In most aspects of public life, a basic failure to communicate invariably leads to bad outcomes and is corrosive to a functioning democracy. Even the currently ascendant Republicans have cause for concern about the erosion of contact and trust. First, getting much of their agenda through the Senate will require 60 votes, which will be difficult to do if there’s essentially a border wall between the two parties (not to mention only 52 Republicans in the Senate). Even legislative successes can be subject to continuous obstruction and repeal efforts in sensitive areas, such as health care, if the majority party fails to attract a reasonable number of minority votes. President Obama learned this lesson with the passage of the Affordable Care Act (or Obamacare), which triggered implacable opposition from Republicans. That experience should be a lesson now, causing Republicans to hesitate in seeking to ram through “repeal and replace” solely with their own votes. Of course, it would be naïve to expect Republican and Democratic leaders to embrace before TV cameras anytime soon. On the other hand, political scientist Frances Lee observes there is actually more bipartisanship in Congress than most people realize (measured by minority support for bills that become law), particularly when party leaders take a lead. Corresponding research from political scientists Craig Volden and Alan Wiseman recently found that members of Congress (even those with strong ideological leanings) who pursue bipartisan strategies are more effective legislators than those who have a more partisan voting record. Past scholarship has found that establishing reputation for such effectiveness increases the probability of reelection for incumbents. But how is it possible to achieve such bipartisan successes when Congress is so ideologically partisan? The more traditional view of deal making, or building out from a center composed of overlapping party members, is clearly far more difficult. In a more polarized situation, experience suggests, it is usually necessary to first concentrate on building a common understanding of an issue and to build a comfort level and trust among those rank-and-file and committee members with an interest in an issue. While this is no guarantee that bipartisan legislation will achieve support in Congress, it is often a necessary condition of success. Certain congressional institutions can be particularly helpful as vehicles for building shared knowledge and trust across party lines, making it more likely that ideologically diverse members can eventually come together to support bipartisan legislation. One of the most important such institutions is the congressional caucus. Research on Congress’ informal issue caucuses suggests they have considerable potential to help build cross-partisan relationships and shared knowledge needed for legislative consensus in some important policy areas, such as improving opportunity for Americans who feel left behind by economic disruption or redesigning a federal budget process that to many Americans appears dysfunctional. Unlike formal party caucuses, legislative caucuses—commonly referred to as “legislative membership organizations”—are voluntary organizations within lawmaking entities, typically structured around common issue interests. They provide an opportunity to build mutually beneficial social networks that facilitate an efficient flow of information among legislators themselves as well as between legislators and organizations external to Congress. Caucuses can help overcome deficiencies in trust and knowledge by helping to create what sociologists describe as “weak ties” —looser, less formal networks—that allow novel ideas and different perspectives to circulate freely across political lines. This process contrasts with more formal, partisan bodies, which tend to resist challenging ideas and perspectives. In this way, caucuses can make it easier for members of different parties, and different ideologies, to discover areas of agreement. In addition, caucuses have an organizing function. They coordinate networks of members without burdening them with undue time and resource commitments that are present in, say, the committee system. Issue Groups. Caucuses differ widely. Some caucuses focus on specific issues, such as cancer prevention, women’s issues, or mental health. Others seek to advance certain economic or regional interests, such as the Rural Caucus. Some others represent a group of members with similar backgrounds, such as the Black Caucus or the Future Congress (members under the age of 45). Many congressional caucuses have close ties to outside organizations, such as industry groups, that represent an economic or political interest. These outside organizations play a key administrative role, often helping to organize meetings and providing research information for caucus members. These external bodies and individuals typically assist through research reports and developing formal policy agendas. Agenda-Setting. Other caucuses, however, have a more educational and broad agenda-development function. This interesting set of caucuses receives outside organizational and research support and are assisted, or effectively co-sponsored, by nonprofit think tanks rather than stakeholder groups. In these cases, the research organization seeks to raise bipartisan understanding of an issue by providing information and helping to organize briefings. For example, the Pew Charitable Trusts helped launch a bipartisan Senate Economic Mobility Caucus in 2012. This built on Pew’s own project on economic mobility, which had featured work from a variety of scholars, including experts from The Heritage Foundation and Brookings Institution. The New America Foundation played a similar research and organizational role in helping to form and provide support to the Congressional Savings and Ownership Caucus. Another example of an “informational-based” caucus is the Congressional Future Caucus (which partners with the Millennial Action Project). The common thread in these efforts remains the desire on the part of both outsiders and lawmakers to improve knowledge and trust and bridge partisan gaps to find common ground on complex and important issues. One year in: Has Trump been good for US workers? Some caucuses are certainly partisan, such as the Freedom Caucus or the Progressive Caucus, but an interesting and welcome trend is that caucuses generally have grown more bipartisan over time, despite the growing polarization within Congress. 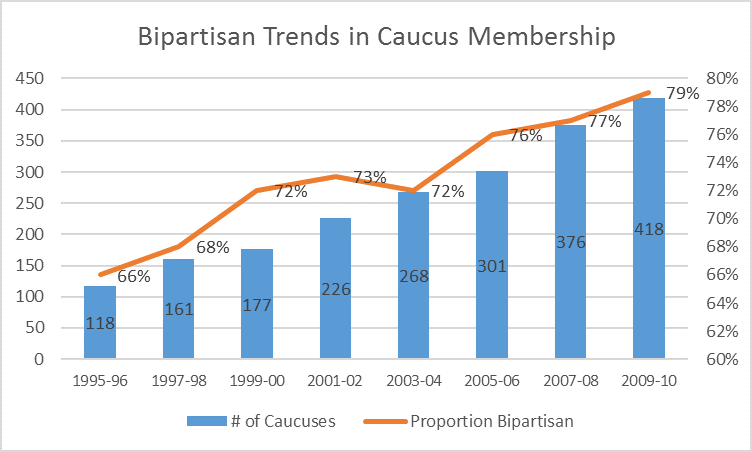 Since the early 1990s, data assembled by George Mason University political scientist Jennifer Victor shows caucuses have not only increased substantially in size, but they have also become noticeably more bipartisan in membership – from about six percent of caucuses in 1995 to almost 80 percent in 2010 (see chart below). Many of these bipartisan caucuses were created with the explicit intent of overcoming gridlock in Washington and solving seemingly intractable problems and politically difficult issues, and ultimately placing solutions on the formal legislating or governing agenda. For instance, the Bipartisan Working Group, created during the 112th Congress (2011-2013), attempts to tackle such difficult issues as tax and debt ceiling reform. Meanwhile, the Congressional United Solutions Caucus sponsors bipartisan conversation about long-term issues, such as entitlement reform, government efficiency, and economic growth. The Former Governors Caucus brings together a bipartisan group of lawmakers, who were former governors, to seek possible agreements on such issues as student loans and Medicaid reform. Comments from caucus members suggest that these organizations, while not a panacea for resolving partisan gridlock, can be the vital first step in establishing relationships and finding points of agreement among members of the opposing parties. The long history of caucuses shows that they have often served the vital function of a legislative bridge builder—bringing members of opposite parties together to discuss solutions to problems that can pave the way for legislation. Research by Victor and her co-authors shows that, while caucuses are far from being an immediate or complete antidote to partisan voting on the floor of their respective chambers, their informality provides a safe space for members to get to know each other, learn about issues together, and explore areas of agreement. This can have important results. Joint action during the information gathering and agenda-setting stages of the policy process can flow over to legislative cooperation. For example, Victor and her co-authors found that bipartisan co-sponsorship of bills is more common when legislators are members of a related caucus. These informal bodies seem to work because they provide a politically low-risk opportunity for lawmakers from both parties to network and share information and ideas on issues that interest them. Because of this, and the shared knowledge that results, caucuses have demonstrated enormous potential as agenda-setting institutions, serving as an alternative vehicle to develop and even advance legislation to circumvent traditionally rigid power structures in Washington. Indeed, in the 1980s and 1990s, members of Congress began organizing caucuses explicitly as an agenda-setting mechanism largely in response to the centralization of party leadership and the subsequent neglect of issues important to many in Congress who lacked the seniority to influence the legislative agenda. Due to this initial motivation, a majority of the early caucuses were ideological and partisan. Fortunately, this trend has since reversed due to concerns over the effect polarization has had on developing and passing bipartisan legislation. As noted earlier, caucuses have become more bipartisan in nature, serving as an agenda-setting mechanism for members who are open to working across the aisle to solve societal issues. The Congressional Future Caucus: This caucus has been instrumental in building an understanding of the issues involved in student loan reform and led to the introduction of a bipartisan bill in Congress in 2016 (introduced and co-sponsored by both Democratic and Republican Future Caucus members). The bill aims to ease financial burdens on recent college graduates. The Economic Mobility Caucus: This played a leading role in creating bipartisan support for a novel savings instrument known as prize-linked savings, which combined features of traditional savings and lotteries to encourage savings by modest-income Americans and non-savers. With the active research and organizing support of the Pew Charitable Trusts (working with a range of scholars from academia and think tanks), caucus members designed and introduced bipartisan bills in both chambers to reform federal laws and permit prize-linked savings accounts to be established by federally chartered and regulated financial institutions. That legislation, the American Savings Promotion Act, became law in 2014. The Future: Could caucuses be a key to progress on issues? Caucuses do have the potential to become an increasingly important vehicle in the future for fostering bipartisan action on some issues by helping to build the necessary social networks and trust and drawing on information from the research community. Promising policy areas where caucuses could provide timely and effective assistance are likely to be those where there is 1) pre-existing bipartisan interest and party overlap of ideas and approaches, and 2) partisan positions are not yet so hardened as to make agreement difficult. Improving the economic mobility of low-income Americans.While there may be disagreement about many features of economic inequality, in recent years there has been growing concern about the disappearance of opportunity for many low-income households. The recent election underscored the fact that deep pessimism about the future is not confined to minority urban communities. In the research and policy community there has been significant agreement on steps that could be taken to restore opportunity for Americans on the bottom rungs of the economic ladder. This includes a report authored by a wide range of scholars sponsored by Brookings Institution and American Enterprise Institute and a report and action network resulting from bipartisan meetings organized by Harvard scholar Robert Putnam. A bipartisan group of stakeholders is also coming together to explore areas of agreement, under the auspices of the Convergence Center for Policy Resolution (disclosure: Stuart Butler is a board member of Convergence). There is broad interest in Congress, including by House Speaker Paul Ryan (R-WI), in ideas to boost economic mobility among lower-income Americans. The worry is that partisanship on Capitol Hill and Republican control of both Congress and in the White House could prevent bipartisan action on an imaginative opportunity agenda if particular proposals become associated with only one party. Thus existing bipartisan caucuses, such as the Economic Mobility Caucus with the support of outside research and policy groups, could be critically important in building the foundations for bipartisan action. Reforming the federal budget process.There is widespread frustration with the federal budget process. The often costly uncertainty associated with missed deadlines and threats of shutdowns is a constant problem for individuals, organizations, and levels of government dependent on federal funds. Questions about the balance of power between the executive branch and Congress in the process, baselines and scoring, enforcing budget rules, the congressional budget committee structure, and the relative treatment of entitlement and discretionary programs are just some of the issues prompting discussion of reform in each party. Meanwhile there has been a growing discussion outside the government about possible budget process reforms, and political scientists and budget experts have suggested reforms and strategies to achieve bipartisan reform. Many of these discussions have produced bipartisan agreement outside Congress on some reform ideas. Within Congress, the Republican chairmen of both the House and Senate Budget Committees offered menus in 2016 of proposed reforms for public and congressional reaction. Many individual proposals do have bipartisan support. But again, the worry is that polarization and distrust between the parties will make it hard to achieve bipartisan congressional support for a package of reforms. Using existing or new bipartisan caucuses, however, could allow non-leadership members of both parties to build the shared knowledge and trust needed to set the agenda for reform. A caucus approach could enable members to reach a better understanding of reform ideas, consult informally with outside experts, and potentially develop a package that congressional budget committee leaders of both parties could advance with the confidence that is has broad support. To be sure, creating a caucus on an issue is no panacea for a breakdown in bipartisan policymaking. However, it is well understood in the theory and practice of reaching agreement on difficult issues that building trust and sharing concerns within informal bodies—outside the glare and high-stakes atmosphere of congressional committees—is critical to achieving broad bipartisan agreement that can then make successful leadership deals possible. Caucuses are a mechanism for members to establish the necessary trust to explore solutions to societal problems, and they have the potential to be an important tool particularly in today’s polarized Congress.